If you have the Moon in Aquarius, your emotions tend to be guided by intellect and you can be very detached when it comes to dealing with them. Others may think you cold and aloof because they don’t understand the ways in which you deal with your feelings. This position steadies your emotions. You find security in dealing with and working with groups of people, especially in endeavors that benefit the majority. You are inventive, original, and progressive in thought and want to make the world a better place to live in. Family ties and attachments may not be as important to you as they are to others and you perhaps often consider your friends closer to you than your blood relatives. You need freedom and independence in your relationships with others. You back away at times if they get too close. You very much hate a partner who is jealous and possessive. You like to experiment and play the field. There is small affection for the conventional and the traditional. You tend to be friendly, intuitive, humane, progressive and independent. You are broad-minded with a desire to investigate all knowledge. You may have difficulty in understanding the emotional needs of others. At times you express unusual ideas simply to shock or surprise others out of their lethargy or just to see what kind of a reaction you’ll get. On the negative side you can be impersonal, stubborn, erratic, rebellious, rigid, emotionally cramped and selfish. With Moon in Aquarius you are altruistic, universal, progressive, original and a lover of freedom. You naturally relate more to groups, movements and to the big picture than to individual personalities. You’re inspired and seldom bound by tradition or domestic ties, for humanity is your family. You bring difficult lessons on yourself due to your own rash and ill-considered actions. Because your emotional nature is mental and abstract, you have a hard time empathizing with others. Your friendly manner masks more self-centeredness than you would like to reveal. 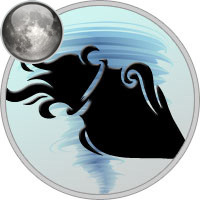 Emotions can be cramped and limited in Aquarius, with arthritic conditions possible in later life due to a rigid will and crystallization of feelings. In a male chart this attracts a stable, fixed mate that can be persuaded but not pushed.